I’ve sung this “I Love Phyllo Dough” song before, through the years here on CamilleCooks. Available frozen, I have easy access. And rather than being too fussy, phyllo recipes for tarts and strudels and hand pies and pot pies and baklava lean toward the rustic, meaning I can be a bit crude and sloppy. That’s good. 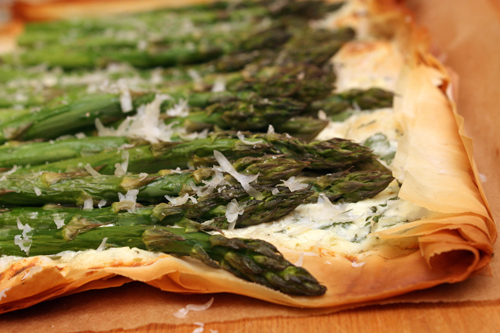 The “Herbed Ricotta, Asparagus, and Phyllo Tart,” from the April 2017 issue of Cooking Light, touts itself as “beginner-friendly,” and indeed it is. I was pulled in by the low-stress assembly. There’s no fussing, here. Layer the sheets of phyllo and brush them with oil. The ricotta mixture is a conservative amount, but it does the job, becoming a tasty, creamy layer after baking. The generous amount of asparagus softens perfectly in the oven. And the sprinkle of shaved parmesan at the end turns this into a party. Phyllo toasts like crunchy paper. Win with this. Next time, I will reach for a nice muffin. The “Pineapple Coconut Banana Nut Muffins,” from Bake or Break, promise a long list of attractive ingredients. Come back to my site next week, to see what happens.